There’s a reason why ‘roof’ is often used to signify the complete house. Roof is the essence of your house and we, at NÜHAUS, specialize in providing you with the best and most efficient roofing contractor service in Dublin. Just like everything else in the construction business, roofing materials and technology have evolved rapidly in the last few decades and we have managed to keep pace with these advancements fairly well. What services do we exactly offer when we say ‘roofing’? Fibreglass offers a virtually maintenance free alternative for traditional roofing materials. 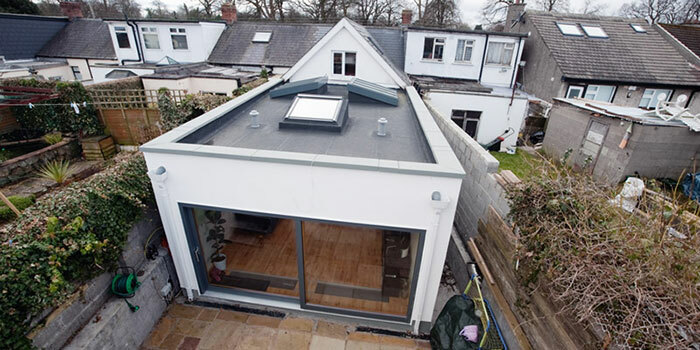 Fibreglass installations over existing roofs are quick and effective. Fibreglass is waterproof and there will be leakage or seepage through walls. Fibreglass can be moulded easily into the design of choice. Better insulation than cement or glass means more saving through reduced energy expenditure. Some clients of ours have reported as much as 8% of reduction in their monthly electricity bills. No leakage or seepage through walls means that the building will be safer, no matter what the weather is. The fibreglass roofing hardly ever requires maintenance and is virtually indestructible. In the future if the need arises to alter or extend fibreglass roofing, it can be done much more easily as compared to traditional methods. At NÜHAUS, we offer you not only construction services but design services as well. This means there will be no more dealing with different companies for one purpose. Our designers will work out a detailed plan after consulting with you and our construction teams will take over from there on. This will save you the hassle and there will be no differences in the design and construction. Our roofing services are overseen and carried out by duly certified designers and construction teams. We work in strict compliance with the planning norms and current building regulations. While going with our Extensions and Renovations services, NÜHAUS is your one-stop solution for everything that’s related the roof of your house. We build not only efficient roofing components, we take extra care to not disturb the outlook of your building.